I’ll be taking my much lighter weight/faster Bianchi road bike, but thought it might be fun to take the REI Hybrid. We didn’t set any speed records – well, actually, I did set one, but it was along Fifth Street in front of the high school. 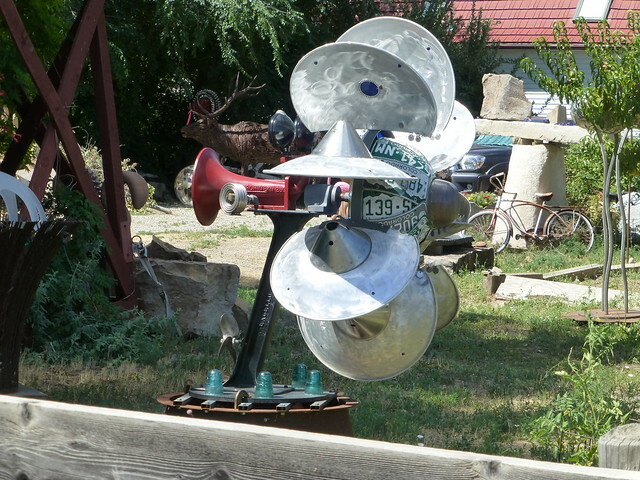 Before starting up the dreaded 38 Road hill, I saw a couple of interesting sights. 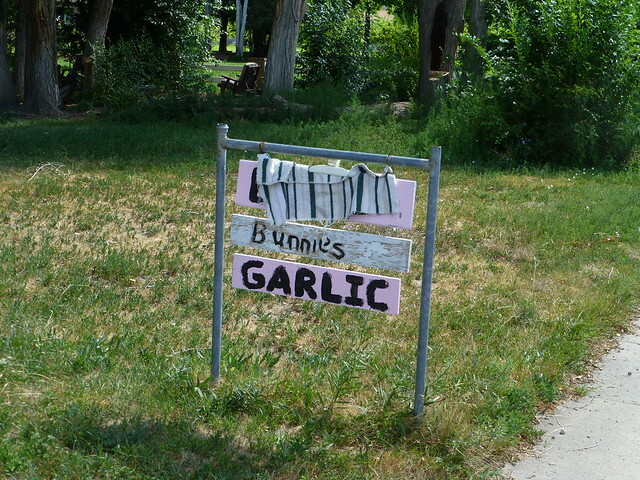 The first was a roadside sign that advertised that they had eggs, bunnies and garlic for sale. The eggs were apparently sold out, but the bunnies and garlic were still there. I should have asked the lady if the bunnies were for eating or petting. 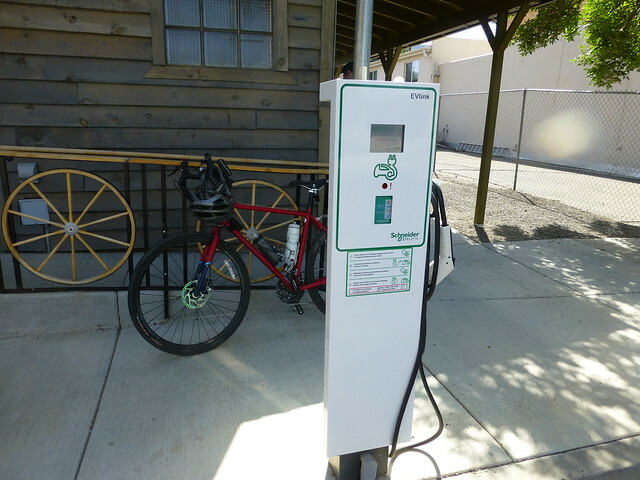 Palisade had a very European looking charging station for electric vehicles. I don’t know how much a charge would cost, but you can pay with your credit card – if it’s equipped with wireless encoding, which few are. We then proceeded up the 38 Road Hill, commonly known among cyclists as Puke Hill. It’s a 7-8% grade, and I made a discovery. My hybrid has such low gears that I can be pedaling like crazy and still going less than 3 miles per hour. Which isn’t fast enough for me to keep the bike upright. Which means that I crashed. No permanent damage to the bike or me, just my ego. Later, we passed by several orchards and wineries. We followed a tractor pulling a trailer carrying about eight Hispanic (probably Mexican) farm workers to pick the Palisade peach crop. They were friendly and waved at us. Very much unlike some of the impatient Anglos who couldn’t wait to pass our caravan (the Mexicans, me and Allen). 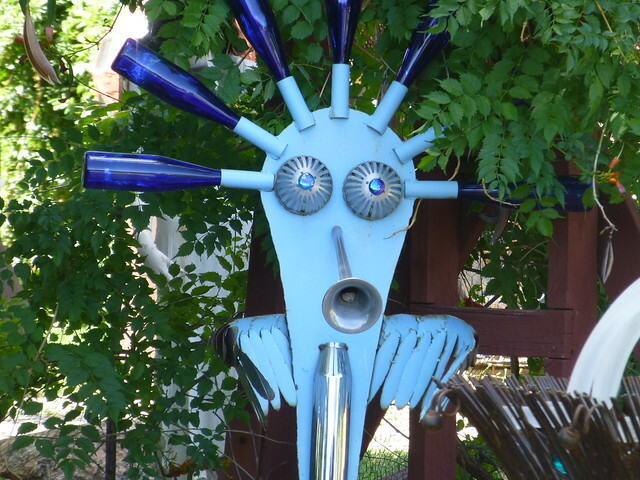 There is one spot where the owner has spent a lot of effort on some very whimsical sculptures. He has a sense of humor, too. In case you were wondering, no, there isn’t a nudist colony one mile ahead. How wonderful. I rode the Tour of the Valley a few years back. It was beautiful.